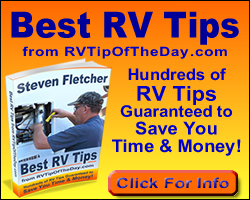 The photos and basic instructon on how to make an Under RV Sewer Hose Storage tube from plastic fence post and rain gutters, below was offered by an RVbasics Yahoo Group member. 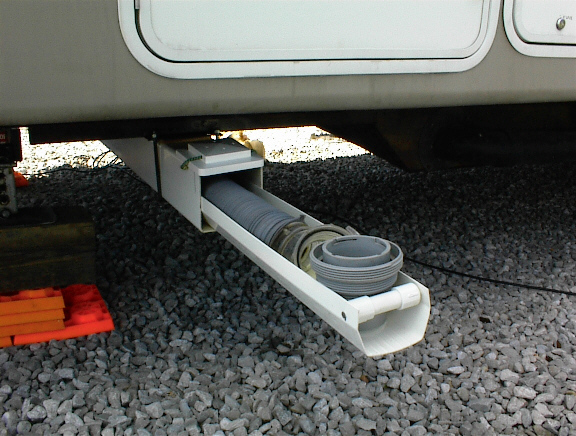 A Basic Parts list for the under RV sewer hose storage tube. 1 - 4 3/4 x 4 3/4 (or 5 x 5) plastic fence post, 8' long (that's the square tube. 1 - length of plastic gutter - They come in 10' lengths. You'll have to cut it. 1 - short piece of 1" or 1/2" pvc pipe the width of the gutter. Ask your local plumber if he has any scraps around. 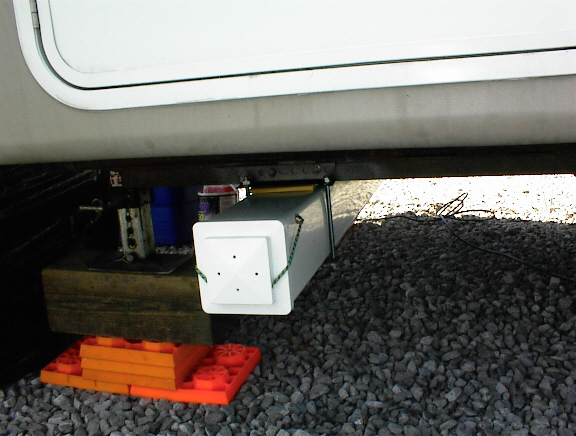 Whatever you need to attach square storage tube to under the RV. We attached it to the front-to-back frame work using 6" lengths of 1/4 inch threaded rod and the appropriate washers and nuts. A piece of flat bar stock holds the bottom of the square tube. We drilled holes every so often in the gutter and some at one end of the fence post to facilitate any draining. Put the end caps on the pvc pipe (the handle) and screw through gutter into cap on each side. Drill 2 holes near the top of the square tube and 2 holes in one cap. Thread a small bungie cord through the cap and insert into holes on square tube. You can fit 2 lengths of rain gutter (a regular piece under the one that holds the sewer pipe) in the square tubing. Since the rain gutters make great hose supports you may want to buy two lengths of gutter.